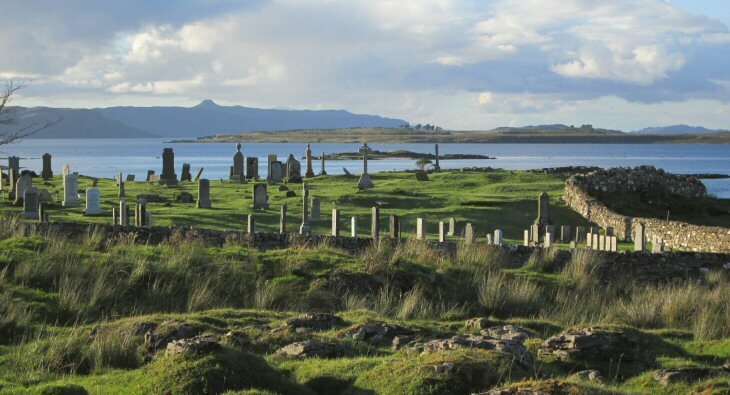 Ashaig Burial Grounds are on the edge of Lower Breakish, near Broadford. The most direct way to access them is via the single-track road off the main Kyleakin-Broadford road, immediately after a bridge, opposite the 'Quiet site' camping ground at Ashaig. Just east of the burial ground is the ancient site of Tobar Ashaig (Ashaig Well) associated with the 7thC St. Maelrubha. Thre burials grounds have separate Albums on the website - Ashaig Old & Ashaig Extension. Picture Added on 01 January 2014. Added by Jan Gladwin on 25 March 2018.